The latest from legendary master storyteller Stephen King, a riveting, extraordinarily eerie, and moving story about a man whose mysterious affliction brings a small town together - a timely, upbeat tale about finding common ground despite deep-rooted differences. In the small town of Castle Rock, the setting of many of King's most iconic stories, Scott is engaged in a low grade - but escalating - battle with the lesbians next door whose dog regularly drops his business on Scott's lawn. One of the women is friendly; the other, cold as ice. Both are trying to launch a new restaurant, but the people of Castle Rock want no part of a gay married couple, and the place is in trouble. When Scott finally understands the prejudices they face - including his own - he tries to help. Unlikely alliances, the annual foot race, and the mystery of Scott's affliction bring out the best in people who have indulged the worst in themselves and others. 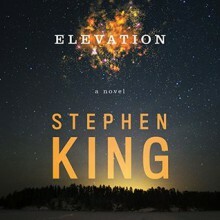 From Stephen King, our "most precious renewable resource, like Shakespeare in the malleability of his work" (The Guardian), Elevation is an antidote to our divisive culture, as gloriously joyful (with a twinge of deep sadness) as It's a Wonderful Life. http://justintate.booklikes.com Justin Tate Likes Books 5.0 Feel-good novel of the year? text Feel-good novel of the year?